I noticed this colourful truck in the car park. adding his hand print to the truck. and others in South Africa. you add four years to the life expectancy of her child. 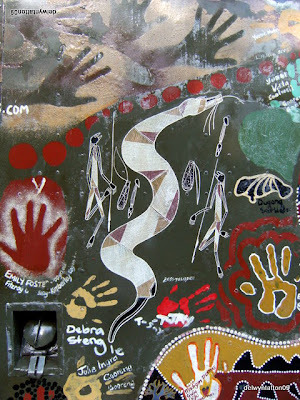 in the photo above is the mythical Rainbow Snake. 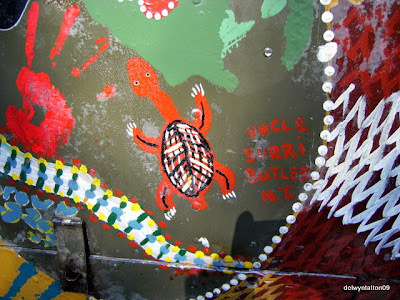 A relative of Murray adorns this section of the truck. one French Open, in the 1970s and 80s. and runs tennis camps in my area. in human form but without mouths. the rain would never cease. and lightning shown around their heads. 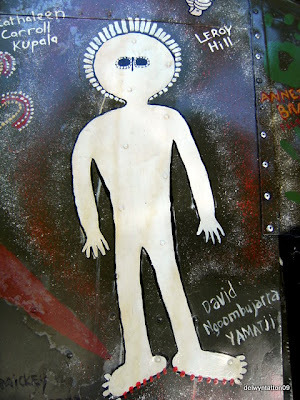 David Ngoombujarra of the Yamatji people. 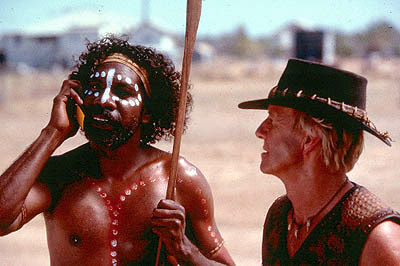 starred with Paul Hogan in the movie Crocodile Dundee. This extraordinary journey began in a 1961 Ex-Army Ambulance dubbed ‘The Message Stick’ that was first built for WAR, now rebuilt for PEACE. 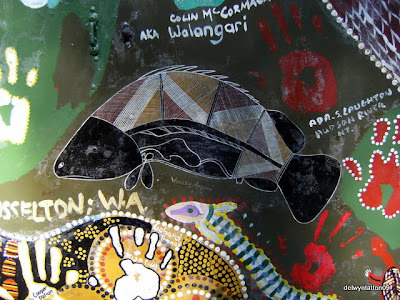 After 10 years in the harsh third world communities in the Australian Outback, Michael Butler, Samantha Martin and Michelle White discover their own awareness in promoting the positive aspects of Aboriginal Australia. 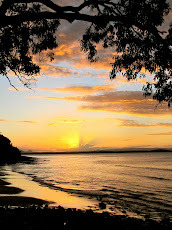 They drove out of Sydney heading North with only $300 dollars in their pockets, a digital camera and a passion to learn about the Aboriginal cultures. ‘The Message Stick’ 4WD vehicle became their home and production vehicle, giving them access into the remote communities in the outback. 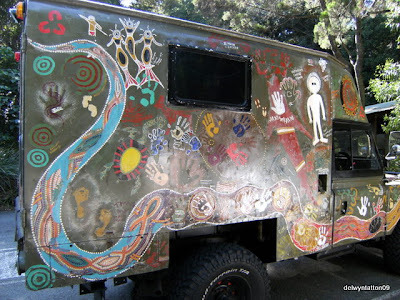 The vehicle is re-enacting a 50,000 year-old story of traditional message sticks that traveled around Australia on foot by young Aboriginal warriors, this form of communication was used to pass on important news and messages to different language groups. 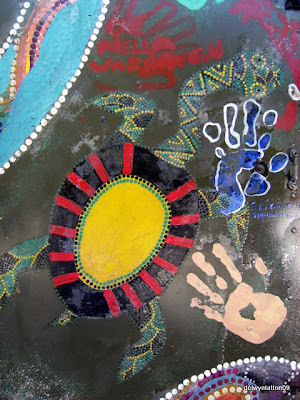 It identifies the bearer and welcomes them on strange land, but instead of a stick this modern day motorized Message Stick vehicle becomes the canvas for Peace and Reconciliation around the World sharing and gathering important messages of the preservation of an Ancient culture. 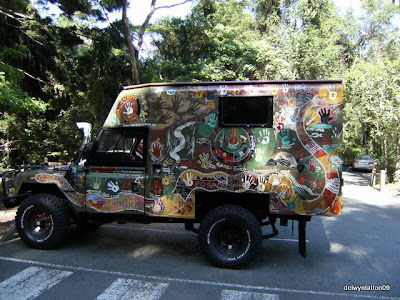 is certainly much more than just a colourful truck. 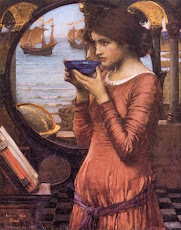 It is an emissary of hope. Hello Delwyn how have you been today?...yes we need hope for our fellow citizens, I do feel it has been left too long without proper attention..I have the privilege to be around this culture because of my sisters Theater over the last 20 years her husband and her have been working closely together and working on reconciliation traveling with various dance groups overseas,we do see change,good change but it is a very slow process. Thank you for shining a bit of positive light on this unique culture. What a great story (and video). Just imagine all the places that message stick has been... Thanks so much for sharing. Mona, tell me more about your sister's theatre work. It sounds very interesting. It is an amazing culture over 50,000 years old! I'll write yo an email tomorrow my friend. 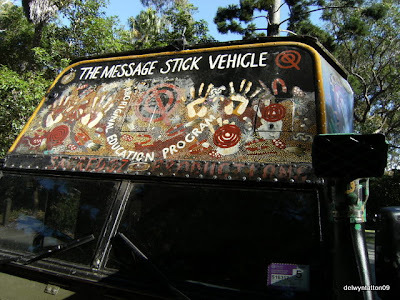 The message stick/vehicle is a great concept isn't it...a great way to learn and share and then to bring this knowledge and understanding back to the larger population. Great informative post Delwyn - what a fantastic idea! The truck looks great.Thank you for visiting recently and leaving a comment. As usual, you ply us with information and illustrations. How fascinating! The statistic about aboriginal women's education and the improved life of children is not surprising, merely common sense. I'm sure it's true in subsistence economies all over the world. The question is, why isn't feeding and educating people all over the world more important that war? 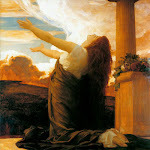 Wonderful post, Delwyn, and a truly fascinating topic. 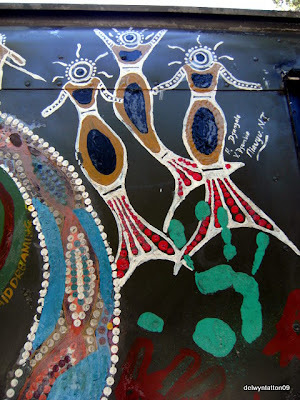 I was intrigued to learn more about aboriginal myths and legends...and the paintings on the truck are astounding. 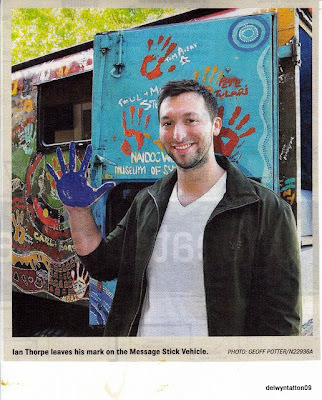 The motorized 'Message Stick' concept is truly worthwhile and so deeply meaningful. The fate of a people is so hugely dependant on education. I read that the truck is now going to travel the world...sharing and advocating for poor communities. 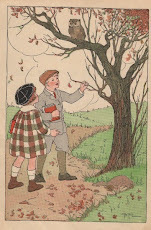 I'm glad you found the illustrations interesting and I thought that you would relate well to this post. I do feel ashamed to know that we have communities experiencing such poverty and deprivation in this abundant country of ours. Fortunately this govt is tackling the issues but as the problem has multiple contributing factors it will take time and patience. 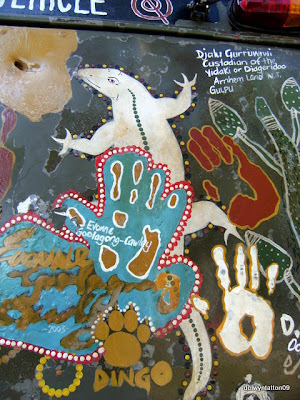 Thanks for sharing these cool Aboriginal arts. They are creatively infuse with many fun colours and details! It's good to see indigenous Australian to have such a great accomplishment in sport. I am so proud of her. 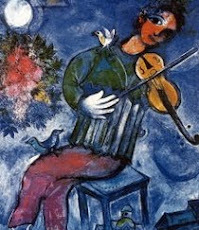 This art is very colourful and energetic - full of life and spirit. 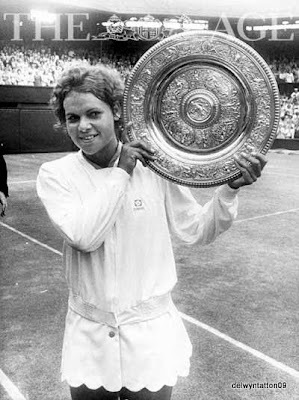 Evonne Goolagong was also in that video - unveiling the truck (now a woman of about 50). Cathy Freeman, an indigenous Au was also an Olympic #1 runner at the Sydney Olympics. Great article and photos. 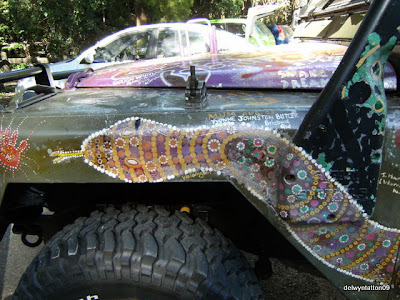 I posted them on art car central with a link back to you:) http://artcar.blogspot.com/2012/03/message-stick-vehicle-australian.html. It has now been 16 years since I re-built the vehicle and now need a home for education and be on display to the world. thank you Michael for correcting me. My apologies to Ernie and David.